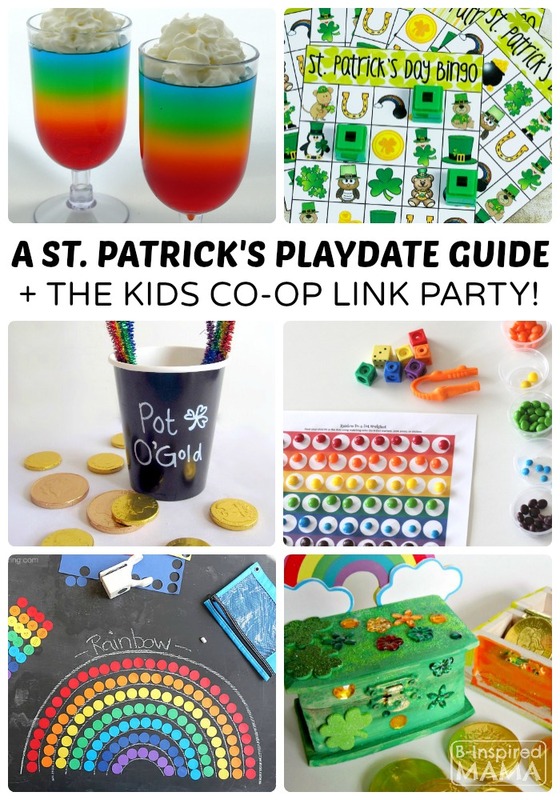 Have a Fun St. Patrick’s Day Playdate! This post has sponsored links. Please see my disclosure policy. Print out these St. Patrick’s Day cutting practice sheets and set up a cutting practice table to keep the toddlers and young preschoolers busy. Put these rainbow counting sheets along with some dice and rainbow candy on a table for some (yummy!) counting practice. Make a simple rainbow busy bag for another learning station with just colorful paper circles! Use shaving cream to make this fun rainbow coin hunt sensory activity. Throw some cereal and scoops in a bin for some easy (and edible!) 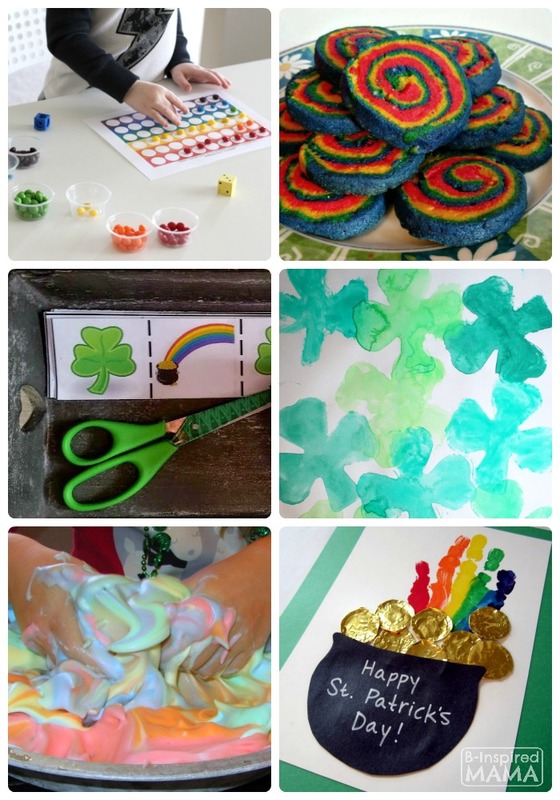 St. Patrick’s Day sensory play. Let the kids use a cookie cutter to help make clover watercolor art. Try these no-prep Scratch Art Shamrocks. Have the kids decorate treasure boxes to make sparkly leprechaun traps! Make Shamrock Ornaments with these easy craft kits. Help the kids use their own handprints to make some messy shamrock art. 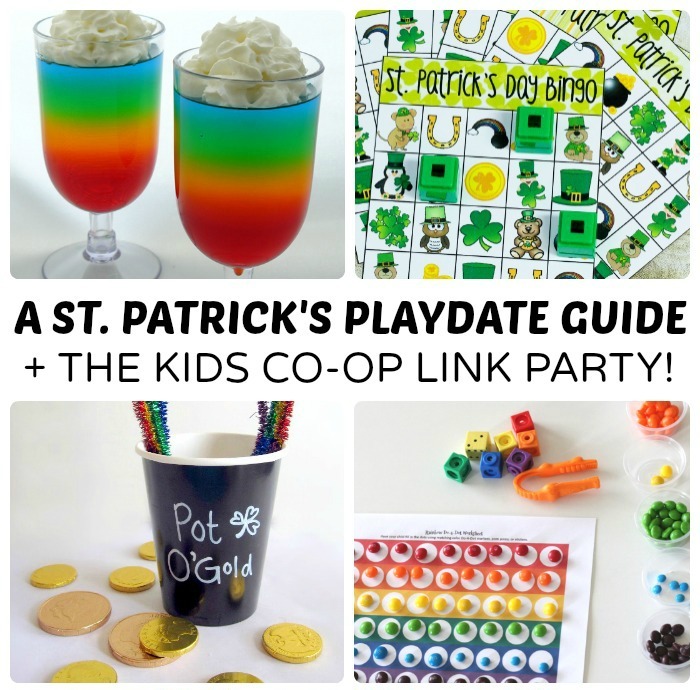 Let the kids make some open ended creations at a St. Patrick’s Day playdough station. Print out and offer these cute St. Patrick’s Day playdough mats to make it even more fun. Or try a different handprint craft – making a rainbow handprint coming out of a collaged pot of gold! 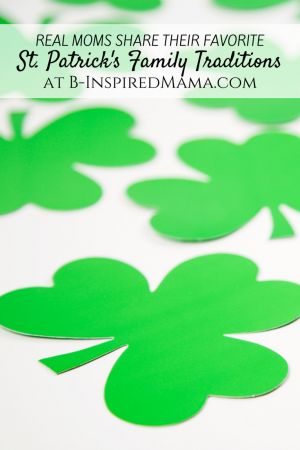 Sing St. Patrick Day Songs – Gather the kids around to sing some St. Patrick’s Day songs together. Check out these free St. Patrick’s Day song and rhyme resources that Living Montessori Now gathered up. Or purchase and download some St. Patrick’s Day Kids’ Music from Amazon. Use a simple cup and pipe cleaners to make this fun treasure toss pot of gold game. Print these free Bingo cards for a St. Patrick’s Day themed game of BINGO! Set up a St. Patrick’s Day treasure hunt for some active outdoor play. Read a St. Patrick’s Day Book – Gather the kids around to read about St. Patrick’s Day. Try The Luckiest St. Patrick’s Day Ever or There Was an Old Lady Who Swallowed a Clover for a giggle. Serve a Rainbow Treat – The kids will LOVE a colorful rainbow treat at the end of their playdate. Whip up some rainbow swirl cookies or layered rainbow jello. What are your and your kids favorite St. Patrick’s Day activities? Share in the link part above or the comments below! Previous Post: « Mama Reads Monday – Extreme Parenting, Siblings, and MORE! 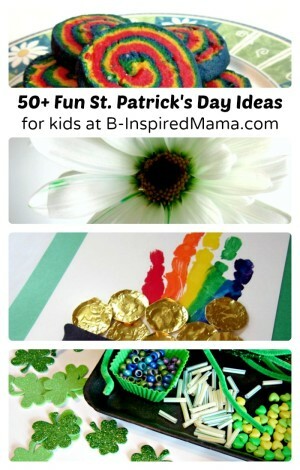 Thank you for including my St. Patrick’s Day activities! Have a great weekend! Thank you so much for including my cutting practice printables 🙂 And thank you for hosting! !